Among those taking part in the celebration were (front row, left to right) HBAM Treasurer Sandra Hughes O’Brien of O’Brien Law Office PLLC, HBAM board member Monica Navarro of Cooley Law School, Cooley Ann Arbor Associate Dean Joan Vestrand, and Cooley Hispanic Latino Law Society President Mia Guerra; along with (back row, left to right) HBAM Secretary Caterina Amaro of Law Offices of Garmo & Associates PC, UDM Latino Law Students Association President William Montoya, HBAM board member Lawrence Garcia of Garcia Law Group PLLC, Cooley law student Ulises Macias, and Wayne County Circuit Court Judge Connie Marie Kelley. 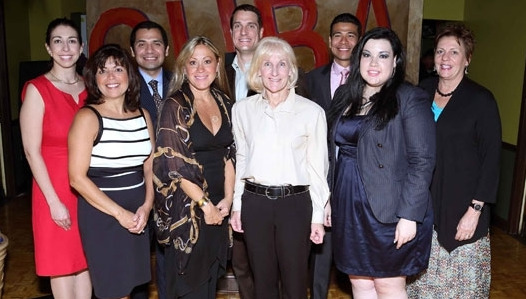 The Hispanic Bar Association of Michigan (HBAM) along with Cooley Law School’s Hispanic Latino Law Societies, Keith Students for Civil Rights at Wayne State University Law School, and the Latino Law Students Association at University of Detroit Mercy School of Law co-sponsored the 2nd Annual Hispanic Heritage Month celebration on Friday, Sept. 28, at Vicente’s Cuban Cuisine in Detroit. The event was aimed at bringing together Latino law students from area law schools. The evening featured authentic Cuban cuisine, live music, and Salsa dancing lessons. Providing the keynote speech on “Realities of a Latino Lawyer” was HBAM board member Lawrence Garcia of Garcia Law Group PLLC. Garcia was honored to be chosen to address the law students. “I think we’ve got such a large growing demographic of Hispanics in America and these folks that are going to be Hispanic professionals are going to be the leaders. . . so it’s very important that they get off to a good start,” Garcia said. A portion of the tickets sold for the event will benefit Farmworker Legal Services of Michigan.